The Bible is scripture for Christians and the Qur’an is scripture for Muslims. There are things that they have in common but there are also some significant differences. Here are seven differences between the Bible and the Qur’an. The Qur’an is only considered to be authoritative in the original Arabic. Muslims do not even refer to Qur’ans in other languages as translations. While it is helpful to know Hebrew and Greek for the Bible, there is nothing sacred about those languages. 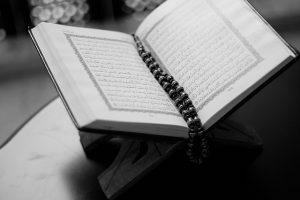 Many Muslims consider the Qur’an to be co-eternal with God. They would not date the Qur’an to the time of Muhammad, but believe it has always existed along side God. A closer parallel than the Qur’an and the Bible would be the Qur’an and Jesus. The Bible contains many genres of writing, while the Qur’an is written in all one style. The Bible includes history, biography, letters, wisdom literature and apocalyptic literature, while the Qur’an is basically poetry. The Bible is arranged roughly chronologically, with Genesis describing creation and Revelation describing the remaking of the world at the end of history. The Qur’an is basically arranged with a short Sura at the beginning and then from longest to shortest. Events from different periods of history appear throughout the Suras. Christians emphasize the human activity in the writing of the Bible more than Muslims do with the Qur’an. While Christians believe in the inspiration of the Bible, we see the Spirit using the personality, style and circumstances of the human authors. Muslims believe that Muhammad simple recited what Gabriel revealed to him. The Qur’an was written over a much shorter time than the Bible. The Qur’an was written over about twenty years, while the Bible was written over a period of about 1500 years. Muslims revere the Qur’an much more than Christians revere the Bible. Muslims react much more strongly when a Qur’an is burnt compared to how Christians react when a Bible is burnt (even though both groups should be upset).